Late this afternoon, I was standing near the exit of Thunder Mountain. 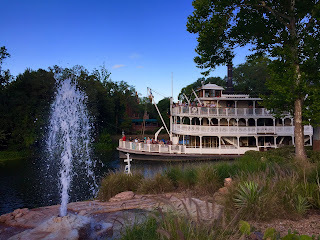 The Liberty Belle Riverboat was moving into view and I decided to try for a fun photo. I was able to time the nearby geyser just as the Belle was in the frame of my shot. It can be challenging to snap a picture of two different subjects in motion, but I like how this one turned out.